The web is a wonderful thing. It means we can connect with people from all over the world and produce work for clients as far away as Scotland (Hi Terrence!). What we miss when working long distance is the personal connection, the human touch and the building of strong relationships through mutual respect and support. Jay Perry is a photographer from Stoney Creek, just outside of Hamilton, Ontario. He believes in supporting local artists, tradespeople and community. (Take a look at his side project Friends with Hearts to see how a few people can change the lives of many in their own community). When he decided it was time to bring his letterpress printing north of the border and work with a local company, he found us on the world wide web, and sent us a note. His request was simple. 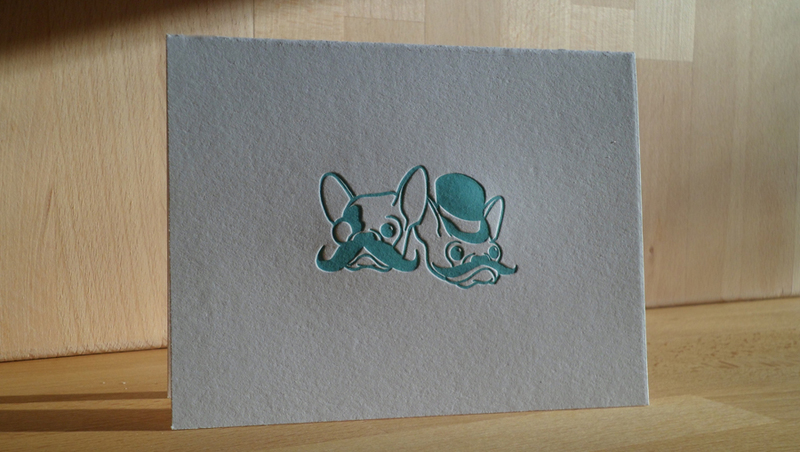 He wanted one-colour note cards with his logo. That’s it, that’s all. Now normally we’re not a trade printer because of our kooky schedules and our love of the design portion of the process, but much like Jay, we try to support and shop local as much as we can. And look how good his logo looks on scrumptious Crane’s Lettra. A match made in heaven. Thanks to the world wide web, we’ve made another great, local connection. If your match made in heaven is looking for a wedding photographer, check out his amazing work at Hilmer & Himson (the adorable pups in his logo). 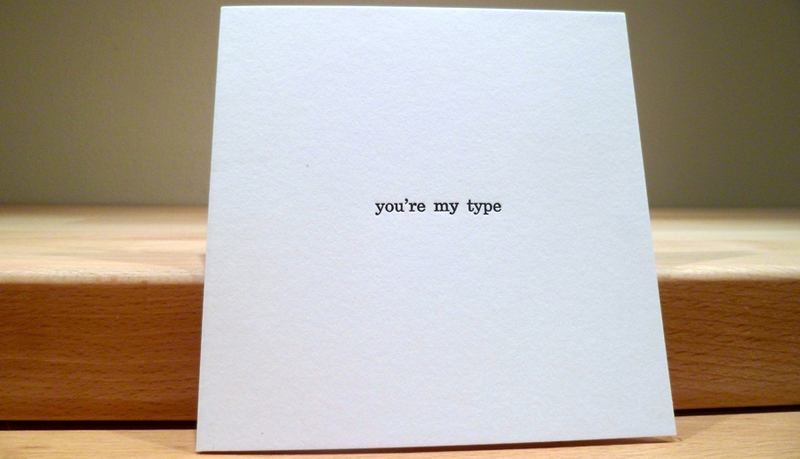 Not into schmaltzy, gooey, sickly sweet Valentine Day cards? Are you a person of few words? Here are the cards for you. A simple declaration of how you feel, with nary a speck of red or pink in sight. 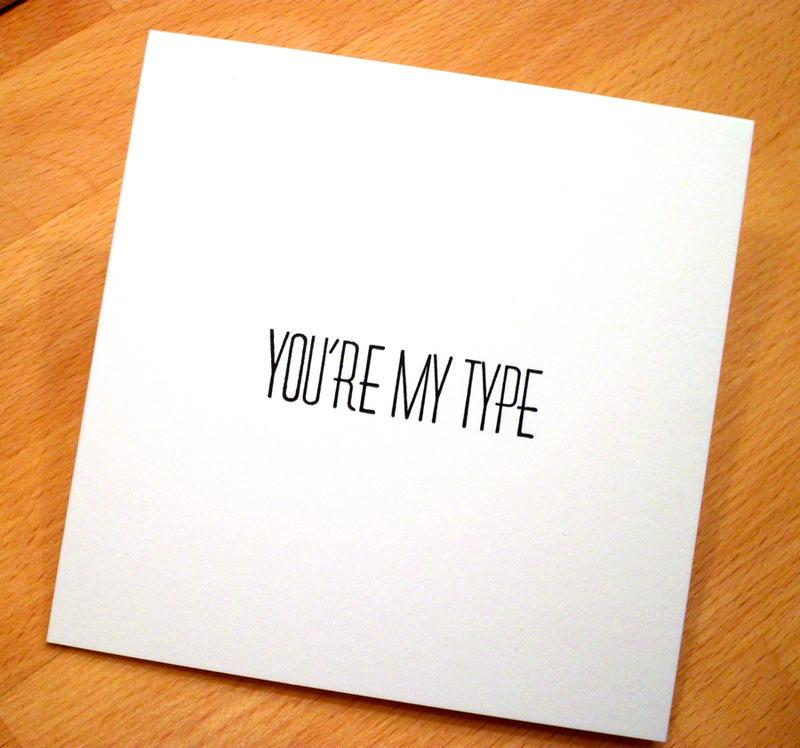 All cards are hand-set using metal type and hand-printed in very limited quantities. 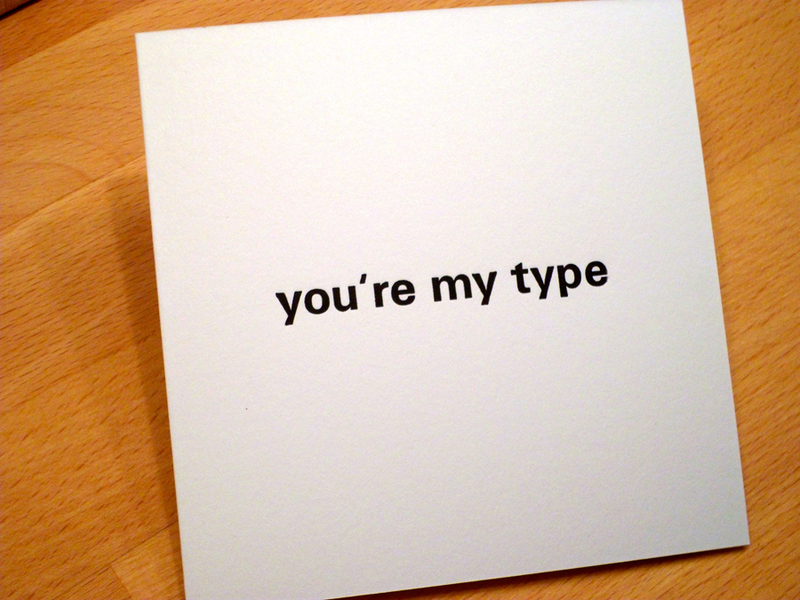 Cards are 4.25″x4.25″, blank inside and printed on pure-as-the driven-snow white Strathmore. Available now in our store. Maybe you’re a little shy and want to express your sentiment quietly with 12pt Century Schoolbook. For those with a little flair and confidence, how about 36pt Huxley Vertical? People often compile lists as a way to remember the past year and to highlight special moments. Tanya created a special list and contacted us just before Christmas to help her create the perfect gift for her husband. They were coming up on their first year anniversary and she wanted something that was one-of-a-kind, personal, meaningful and reflected how much she loved her husband. The traditional gift for a first year wedding anniversary is paper. 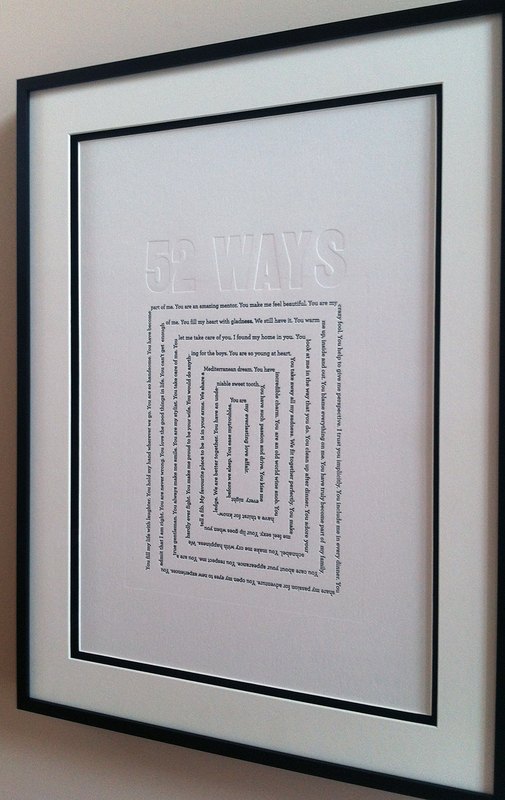 Tanya’s idea was to create a custom designed and printed poster to celebrate 52 Ways she loved her husband – one for every week of their marriage. 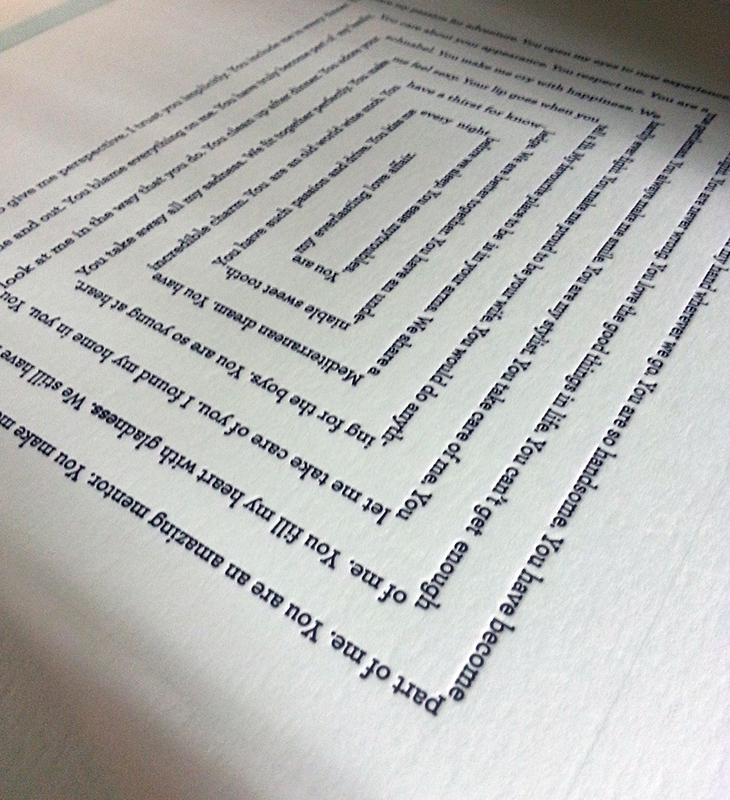 Lucky for us she decided on letterpress and found us online. We are so thrilled and honoured to be part of this very touching project. Helping her create her own piece of art is very rewarding for us. And we hope she and her husband enjoy compiling a new list for the years to come. Thanks, Tanya for the picture of the framed piece and so glad to hear your husband loved it. Who says romance or print is dead?